"Toy and movable books" abound in board books for the preschool readers, a whole genre of books with gizmos such as flip panels, cutouts, pull tabs, turning gears, and other irresistible moving parts to keep little hands busy and little eyes and minds engaged. But for older readers, a book which combines serious science information, interactive fun, and a jumping-off place for an elementary-age reader's imagination to have free play-- that's a real gem. 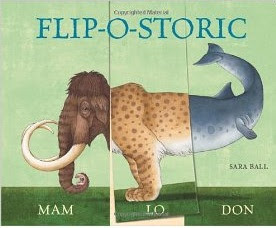 Sara Ball's newest design, Flip-o-storic (Abbeville Kids, 2011) is that book. The device in this solid and well-thought-out interactive book is a simple one. With a spiral binding, each heavy-duty, vertically divided "page" contains one-third of a prehistoric animal, familiar ones such as the saber-toothed tiger (Smilodon) and the mammoth (Mammuthus Primigenitus), and less-known ones--eleven in all--Dorudon, Coelodona Angiquitatis, Unitatherium, Macrauchenia, Gostornis, Argyrologis, and Icaronycteris. Succinct but solid information about the animal's habitat, morphology, behavior and the meaning of its scientific name, is included in three incisive paragraphs above each column of each "page." After the complete eleven pages are read and the detailed illustrations studied, then the hands-on fun begins as the reader can flip each section separately to construct his or her own prehistoric beast. Initially, it's just a hoot to make some preposterous critters such as the combo shown on the cover, but contained within even that free-form exercise is some scientific learning. What would an aquatic animal with tusks do and be? How about a "long neck" with the powerful hindquarters of a Smilodon? There are nearly a thousand possibilities here! 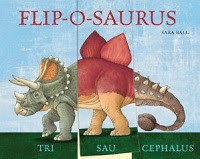 With its companion book, also designed by Sarah Ball, Flip-o-saurus (Abbeville Kids, 2010), these books offer young paleontologists an introduction to prehistoric animals that provides both amusement for toddlers and an insight into animal taxonomy, how scientists classify animals by their morphology and their life cycles for older students who bring a little "book-learning" to the table here, with fun for all along the way.